Making a website is one thing. But maintaining it is other. It is not enough to design and develop a website and place it on the World Wide Web. Yes, you would have an online presence but you would have 'exclusive' an online proximity. If you need to have a successful web presence and create your website achieves its prime goals and objectives, it is importance that you maintain it well and keep it up to date. Only if you keep it updated, will your visitors have upcoming. Adding new dynamic features to the website. Developing tools to generate reports to monitor site progress. Changing design templates of the website. After the site has been developed and we begin the maintenance process. Our team goes about understanding the likings and the business model of the client. This allows us to think of new features that could be added to the website to increase the number of visitors. We then discuss these ideas with our clients and a brainstorming session follows. We then implement these changes to the website. This increases the number of hits to the website and supports the marketing drive. Often a client has a website already developed by some other vendor. However, due to some or the other reason, they wish to change the service provider. They therefore contact us to incorporate certain changes or bring about enhancements to their website. We put such tasks under 'Website Maintenance'. Initially we invest our time to understand how the site is developed and around what business model it revolves. 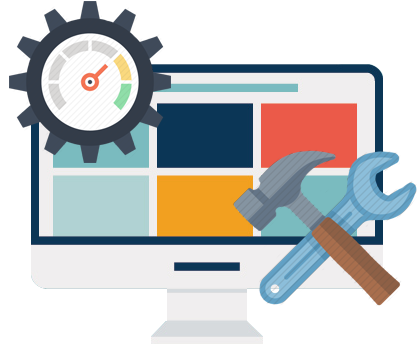 Once we have ascertained this it enters the regular process of website maintenance. Designing and developing a website, maintaining a website, optimizing a website for search engines and acting as a consultant for our clients, makes us proudly say that we are ‘ONE STOP SHOP’ for all the web related needs of our clients.